My name is Suzanne Fairchild and my husband and I have seven children and we own a custom cattle feeding business and other livestock for private sale. We also have a 700 vine vineyard, and an apple orchard being planted in the spring of 2010. After our family and the farm, comes my love of creating art. There is a lot of variation of themes in my work, but there is always a common bond: nature. Enjoying the challenge of painting on natural items; bones, shells, eggs, etc., I also have started to paint on barn doors this past year. 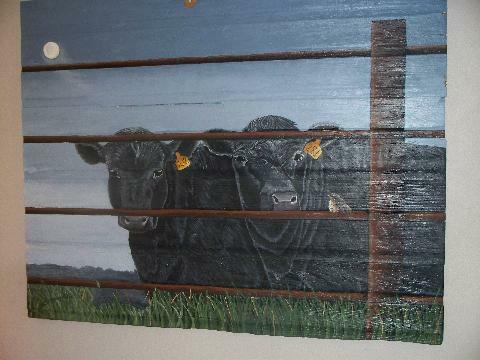 The painting that I have on this page is of some feedlot steers on our farm. As my husband and I checked cattle one night, we came across this baby robin sitting on the continuous fencing without a mother in sight. I named it "Moonlight Sonata".